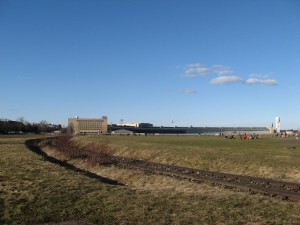 Tempelhof Airport was the second “park” I took the Fulbright girls to on that lovely Saturday afternoon. Tempelhof is a very historical airport. Remember the Berlin Airlift during the Cold War? The Airlift took place at this airport. 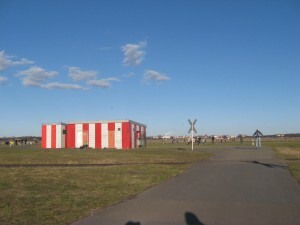 The airport was active for commercial use after the Airlift, but was eventually closed in 2008. Among the many changes constantly taking place throughout Berlin, the city has gradually been gearing up for a one-airport solution, Schönefeld Airport. Tegel Airport is still in use but it’ll eventually be phased out in the coming years. If you’re curious about German mentality in terms of airports, you can go here and read about Berliners’ solutions for noise control and other eco-friendly features regarding their airports. I don’t know much about Tempelhof outside the superficial knowledge that there were many debates about the potential use of this space. Museum? Park? It takes a lot of money to maintain a park especially if there’s nothing in the park that could bring in revenue for the maintenance costs. The park is gorgeous. I especially loved the idea of running around on the abandoned runways and pretending to be an airplane. Kite-flying, BBQ-ing, dog-walking, skateboarding, frisbee-throwing, bike-riding and picnicing adventures are to be had at this wonderful park. And oh…if you need a safe and and open space in Berlin for your kids to learn how to ride a two-wheeler, it’s definitely here. 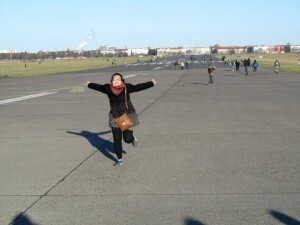 This entry was posted in Jill Nguyen '10, Fulbright to Germany and tagged Tempelhof Airport. Bookmark the permalink.